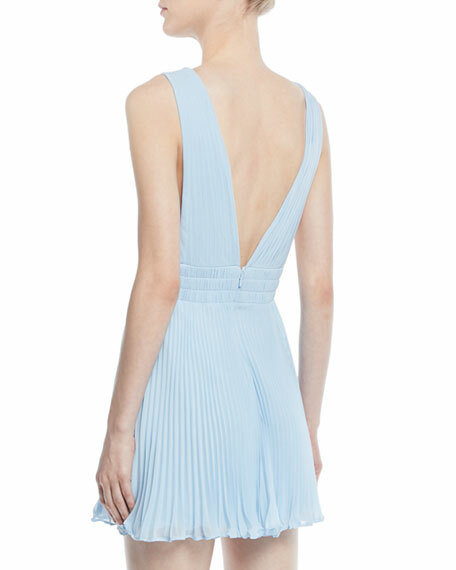 Fame and Partners "The Briella" cocktail dress in pleated georgette. Amanda Uprichard "Linette" dress in fluid georgette. Choker neckline; V front cutout. Three-quarter blouson sleeves. Self-ties at waist. A-line silhouette. Amanda Uprichard "Linette" dress in fluid georgette. Choker neckline; V front cutout. Three-quarter blouson sleeves. Self-ties at waist. A-line silhouette. Keyhole back. Slipover style. Polyester. Made in USA of imported material. Elie Tahari "Raylan" cold-shoulder dress. Round neckline; keyhole-cutout front. Short flutter sleeves; cold shoulders. A-line silhouette. Hidden back zip. Mid-thigh length. Linen/viscose/spandex. Polyester/spandex lining. Dry clean. Imported. Model's measurements: Height 5'10"/177cm, bust 33"/84cm, waist 25.6"/65.2cm, hips 35.8"/91cm, dress size US 2-4/FR 34-36. Halston Heritage georgette cocktail dress with draped front detail. Approx. 32"L down center back. Turtleneck; bow tie at back of neck. Sleeveless; cutout shoulders. A-line silhouette. Mini length hem. Hidden back zip. Polyester, silky georgette. Crepe de chine polyester lining. Dry clean. Imported.